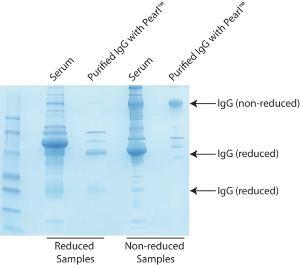 The Pearl™ IgG purification kits are available in two formats - a spin format that is ideal for the rapid, small scale purification of IgG or a larger format kit for the isolation of IgG from ~100 ml serum (~200 mg 1gG). Toimitustiedot: The spin format kit is supplied with 3 ml Pearl™ IgG purification resin, IgG isolation buffer and 20 spin columns. The large format kit contains 25 ml Pearl™ IgG purification resin and IgG isolation buffer.